But Nintendo Labo VR, the company&apos;s first serious VR product, is hamstrung by a nagging feeling that its solution to "VR-on-Switch" is the very thing getting in the way of the fun. Its players are constantly urged to get out of VR, whether by lengthy cardboard build times, pint-sized VR experiences, or the sheer strain of having a 720p Switch screen filtered through a pair of glass lenses. The result is a serviceable take on VR, and I don&apos;t blame any Switch fan for seeing its starting $40 price and biting. That&apos;s as cheap a foray into "legitimate" VR as you&apos;ll find (assuming you&apos;ve already gotten $300 of fun out of a Nintendo Switch in non-VR ways). But that&apos;s not a great caveat to slap onto a Nintendo experience. Labo VR is a rare case of the big N actively fighting with, and losing to, its own hardware in delivering anything close to magical. Nintendo really doesn&apos;t want anybody setting fires with this thing. Flapping will make the visible Joy-Con bob up and down, thus making the whole headset rock repeatedly on a player&apos;s nose. Ugh. The Labo VR Kit&apos;s biggest piece is this pump-action rifle. These images are translated by a pair of glass lenses, and the resulting experience is a lot like Google Cardboard. Hold the box up to your face at a starting weight of 423g/14.9oz, press its plastic face to your nose, and move your head aroundthough you should only do so in a stationary or spinning chair. As a Three Degrees of Freedom (3DOF) VR system, Labo VR will accurately translate your head&apos;s rotation so that it looks like you&apos;re doing the same thing in a virtual world, with two moving, stereoscopic images that allow you to perceive depth. But this illusion will break should you stand up or step in any direction. Your virtual self is effectively stuck on a tripod. 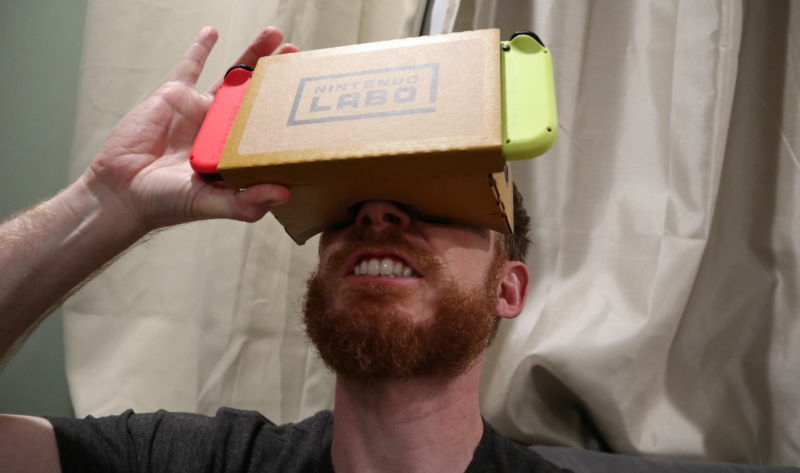 Unlike Google Cardboard or Samsung GearVR, however, Labo VR&apos;s lenses interpret a different slate of pixels. 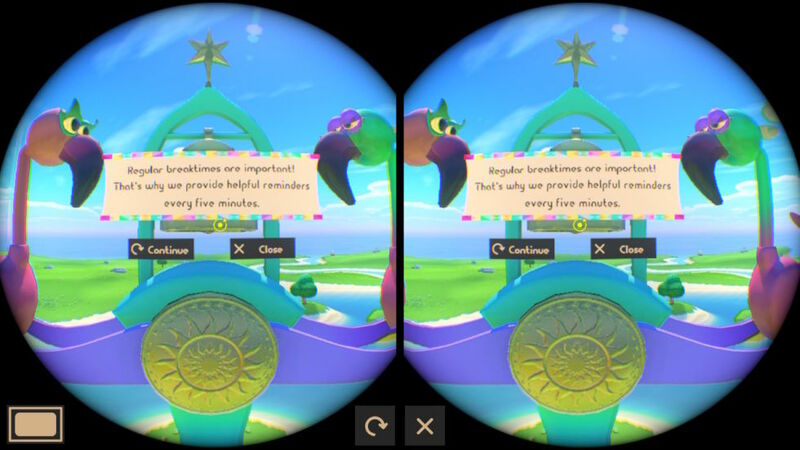 Go all the way back to 2015, for example, to the first formal GearVR consumer launch, and you&apos;ll find that its "minimum" phone was the Samsung Galaxy S5, equipped with a 5.1" (129.5mm) "Super AMOLED" display with a resolution of 2560�1440 pixels. The Nintendo Switch, on the other hand, stretches fewer pixels (1280�720) across a larger 6.2" (157.5mm) LCD panel. Thus, the Switch&apos;s lousiness as a VR screen isn&apos;t simply due to pixel resolution. OLED panels have long been favored by VR headset makers, owing to their "true" blacks, which are easier on eyes in a VR headset. Many of these OLED panels can have "low persistence" modes enabled, which reduces evident blur effects. The Switch&apos;s LCD panel, however, doesn&apos;t have any "fast-switching" capabilities to help with its obvious, annoying blur. Worse, because the Switch&apos;s panel is so big, its effective VR displaythose ovalshas to be smaller to translate to glass panels that are the right shape and size for human eyes. That last issue becomes most apparent when tricking a Nintendo Switch to run in "2D" mode while inserted into the Labo VR headset. You&apos;ll get dizzy almost instantly if you look at this with both eyes open, but if you close one eye and try this out, you&apos;ll instantly notice a lot more pixel fidelity fed into each eye. All of which is to say: a 720p panel is weak enough for VR, but the Switch is effectively running at a lower resolution than that to make Labo VR work. The science is still out on VR&apos;s effects on children. And Labo VR&apos;s approach is arguably more severe for kids&apos; vision than other systems. Some of the mini-games that don&apos;t require any add-on masks to test out. Labo VR&apos;s glass lenses translate this curved imagery so that players have a true "stereoscopic" image. ...and boots the opening sequence to the system&apos;s pack-in game. Sadly, Nintendo didn&apos;t make videos for more of that system&apos;s games. This video is tragically short, as well. This "VR car" game isn&apos;t really a VR experience. Instead, you get a ground-level view of a third-person car. Most of Labo VR&apos;s mini-games are disappointing in this way. OK, here we go: fake like a goalie and block incoming soccer balls. This is actually a decent VR mini-game (though Sony&apos;s PSVR version is much better). A few of the mini-games are just collections of toys that you can pick up and throw. It&apos;s fine, but it&apos;s no Garry&apos;s Mod. Most of Labo VR&apos;s experiences are designed to work around its issues with blur, meaning that they&apos;re short, they&apos;re slow, and they constantly try to boot players out of the fun. Should you only build that default headset, you&apos;ll get access to 32 VR mini-games. Less than half of these do anything meaningful with your VR perspective. Some of them revolve around a Mario-like avatar that you control with Joy-Cons (attached to the Labo VR headset, since you have to hold the whole thing with two hands). You&apos;ll run and jump while managing a frozen camera with your head&apos;s perspective, but only a few of these challenges offer any meaningful reason to look aroundusually to find and activate items and platforms in your hidden visual periphery. Other "sports" mini-games do a similar thing with a frozen perspective, only to add a single floating hand to the formulayou&apos;ll only hold the headset with one hand, then you&apos;ll use your other to hold a Joy-Con as if it were a true hand-tracked controller. Spoiler: it&apos;s not. By default, a standard Joy-Con only works in 3DOF sensing mode, and that weakness is exposed when these games ask you to emulate a golfing putter, a basketball shot, or a boomerang throw. The mix of these motions&apos; inaccuracy and an awkward one-handed headset grip make these mini-games downright criminal for Nintendo to include (especially for the company that practically invented motion-controlled sports gaming). Labo VR includes many more mini-games, but most are gated behind a "cardboard wall." As in, you&apos;ll need to construct other bending, folding, and trigger-loaded masks to slap your Labo VR headset into before you can use their in-game content. Other Labo kits have come with a variety of quirky cardboard controllers that fundamentally change how their games and apps work. In the Labo Variety Kit, for example, a cardboard piano functions quite differently from a cardboard house or a cardboard fishing rod. Each of those takes advantage of the Joy-Cons&apos; sensors to enable wholly different gameplay styles. Only the elephant mask offers a truly unique and—dare I say it—magical experience within Labo VR. This mask attaches a pair of Joy-Con controllers to a cardboard "trunk," which is bound together by rubber bands. These afford, and restrict, how far you can aim, twist, and turn its pieces. Plus, this rig aims the right-hand Joy-Con&apos;s infrared sensor at a grid of reflective, white dots. All of this combines to deliver something unique for Labo VR: true 6DOF control, so that your hands&apos; placement is accurately mapped in real-life space. Move any part of the trunk, and its real-life motion is reflected by a mix of a semi-rigid trunk construction, a pair of Joy-Cons&apos; motion sensors, and a double-checking infrared grid. Even Nintendo&apos;s old Wii MotionPlus controllers couldn&apos;t pull this off, since they still lacked absolute real-life tracking. The elephant also enables a pretty blatant rip-off of Google&apos;s impressive TiltBrush app for PC VR systems. No shame in that, of course—if you can&apos;t afford a PC VR headset (and the requisite computer to match), and you want to see what the TiltBrush fuss is about, Nintendo&apos;s approximation is solid. Just like that app, you can place dollops of paint wherever your hand reaches in order to create true 3D sculptures, as opposed to flat 2D canvases. Since you have to sit still within Nintendo&apos;s art app, however, you&apos;ll need to use a "grab" tool to reposition your sculptures so that you can more finely build their three-dimensional shapes. But, hey—it works. My biggest beef with the elephant mask is its finicky construction, which relies upon thin, robust cardboard pieces and tangled rubber bands. The more I returned to this mode, the more I felt like my VR self was suffering from injured ball-and-socket joints, always wanting to reach further than I physically could thanks to the physical limits when the rubber bands got a bit tangled. Still, the mask&apos;s ability to truly track hands, however limited, is quite impressive within a 3DOF system like Labo VR. Anybody unfamiliar with the glorious hand-tracked freedom of the HTC Vive may have more patience with its limits than I did. The other masks, meanwhile, are obnoxiously redundant. The collection&apos;s best mini-games are enabled by the elephant mask attachment. Here&apos;s a spatial-puzzle game where you have to move objects around in order to guide a marble through colored rings. This opening level asks you to move a single blue ramp to create an all-rings path. These puzzles get way more difficult. And in this painting app, look down to find a bunch of paint materials. Then paint up and create a truly three-dimensional piece of artwork, thanks to this mode&apos;s 6DOF "hack." Proof that I could grab the image in 3D and rotate it, thus showing that it was drawn with a literal curve. As clean and pretty as the Toy-Con Blaster game looks in still shots, it&apos;s a mess to play in action, between excessive motion blur and the feeling of the cardboard gun slamming against your face over and over. Missing from this seemingly cool-looking screenshot: the feeling of a cardboard gun slamming into your face every time you have to reload the thing. ...if they weren&apos;t interrupted on a regular basis with breaks to a "you took three photos" menu. Shame, because this admittedly small underwater zone is a fun one to hang out in. The same charm and complaints apply to the other camera-related experience, which has you hang out with this puffy critter. Flap cardboard wings to fly around this island and hunt for baby birds. Find various food types to turn chicks into full-blown adult birds. The best of these is the camera, which should have shipped in the "starter" VR kit, as far as I&apos;m concerned. This mask asks players to hold a "lens" with one hand, which can be rotated 90 degrees back and forth, and a Joy-Con with the other, secured into the case so that it&apos;s part of a camera&apos;s body. Holding a Switch up to your face this way offers two simple, comfortable control systems—an analog dial and a basic button—that would have scaled perfectly to Labo VR&apos;s bird-mask and gun-mask modes. You may assume that those other masks, which include a flappable pair of wings and a recoil-loaded shotgun mechanism, respectively, would be a blast to use in a Nintendo game. Outside of the VR ecosystem, yes, they&apos;re pretty cool. They turn some basic cardboard pieces into elaborate toys that kids and parents can team up to build (which, again, is much of what makes Labo "special" as a gaming product). But once they&apos;re built and used as game controllers, both require frequent, substantial motions... against your face. It only takes about ten wing flaps or five recoil-loaded gun blasts to run headlong (pun intended) into some serious problems. First, the Labo VR headset&apos;s plastic face is already a bit uncomfortable to use in the kit&apos;s calmer modes, let alone when a combination of hands and cardboard-driven momentum are forcing it back and forth against your face. (The shotgun, in particular, has some serious kick, owing to a pair of rubber bands that launch a noisy "clacker" box over and over.) Second, the Switch&apos;s built-in motion sensors do a terrible job of accounting for motion drift when these stronger mechanisms are constantly shifting the whole rig. Third, these masks&apos; extra motions pile unnecessary motion blur onto the default experience, which already suffers from a baseline amount of motion blur by default. Thus, I wish that the bird-mask&apos;s flying mode and the gun-mask&apos;s arcade-shooting mode were scaled to recognize, and work with, the camera mask. It&apos;s a perfectly comfortable mask to hold and aim, and it includes the buttons and analog manipulation needed to have fun in both. Funny thing: Nintendo also includes a non-VR shell for the Nintendo Switch&apos;s screen, so that you can slap the system into any of Labo VR&apos;s masks and try out a pseudo-VR experience. The catch with this is that Labo VR&apos;s field-of-view (FOV) is painfully narrow, a fact that is only remedied by tiny head movements while in a VR mode. Nintendo doesn&apos;t scale this FOV to accommodate for how people look at traditional "pancake" screens. Instead, if you opt for pseudo-VR, you&apos;ll have to move the system a lot more deliberately to take in any missing peripheral scenery and objects. Enlarge / Nintendo Labo VR frequently reminds players to pause or take breaks. Often, it will interrupt a perfectly calm and nice gameplay sequence to do this. And while you&apos;re in the VR perspective, each Labo VR mini-game finds ways to both slow your momentum and drag you out of the experience. For example, the bird mask&apos;s primary mode has you flying calmly and peacefully around a sunny island, on the hunt for baby birds and various items, at a painfully slow speed—assumedly to keep players comfortable, should they look sideways while flying. Every five minutes, this flying game pauses itself to remind players to take a break. In fact, every mode in Labo VR either comes with frequent warnings, a painfully brief playtime (like the aforementioned "default" mini-games), or some built-in limitation to yank players out of the fun. The worst is the pair of games attached to the camera mask, which ask players to hunt for, and take pictures of, dozens of quirky moments in a pair of dioramas (an underwater canyon and a little house). These are lovely to bliss out with, should you be fine with a family-friendly, low-challenge kind of game. But this VR scavenger hunt punishes players by dragging them to a menu every time they&apos;ve taken three photos. That&apos;s not a typo. Should you get excited and want to take more than two photos of something, the game will slowly dump you to a menu, let you review your last three photos, decide whether you want to save said photos for later, and then make you rotate your head to find the "continue" button so you can go back to enjoying the VR Labo set&apos;s most comfortable controller. Conversely, the gun-mask&apos;s levels play out like a &apos;90s light-gun arcade shooter, sending players through an on-rails shooting gallery challenge. Labo VR encourages "100%" completion of these difficult levels, and reaching that performance threshold requires rapid, violent turns to hunt down and shoot the foes in each level. The result is way too much motion blur, along with a lot of antsy reloading of the gun&apos;s single-bullet chamber. Thus, you can look forward to uncomfortable visuals and slamming the headset into your face. Cool. That issue may explain why Nintendo packs redundant masks into the box: to spread out Labo VR owners&apos; use of the uncomfortable VR modes, whether because they&apos;re building new cardboard sets or swapping Joy-Cons from one to the other. One of these is a foot-controlled pedal with a giant cardboard fan attached that takes no less than 80 minutes to build. You can simulate this pedal&apos;s motion-sensing function by tucking a Joy-Con into a shoe and tapping your foot up and down, though you miss out on the sensation of "wind" when pressing down in its "leaping as a frog" mini-games. If each cardboard "Toy-Con" construction had enabled truly unique gameplay modes, or at least hadn&apos;t repeatedly slammed a plastic mold into my face, I might have had more patience for so much building. But this full Labo set wore me out. And Nintendo&apos;s decision to bundle the "starter" set with the disappointing gun, as opposed to the cozy camera, makes Labo VR all the more difficult to recommend to an average Switch owner. I&apos;d rather VR newbies pull the gun on the $200 Oculus Go, which is a far more impressive (and comfortable) 3DOF VR platform, but that&apos;s nowhere near the impulse-buy territory of Labo VR&apos;s $40 starter set. And for all the shade I&apos;ve cast here, let me be reiterate a point I made at the start: Labo VR is fine. Serviceable. Decent. You&apos;ll get some fun out of building these Toy-Cons with your kids, though Labo&apos;s Variety and Vehicle Sets are better in that regard. Your eyes, and those of your older kids, won&apos;t melt by using this slightly uncomfortable set—though Nintendo warns parents not to let kids under seven use this, and I&apos;d argue that the science about kids&apos; vision and VR is still far from conclusive. So long as you appreciate how much better VR can be, and that Nintendo has been soundly trounced in the good-VR-design department by the likes of Astro Bot, Tetris Effect, TiltBrush, Vacation Simulator, Superhot VR, Moss, SuperHyperCube, Space Pirate Trainer, and on and on and on... then, sure, give Labo VR a whirl. Just don&apos;t say I didn&apos;t warn ya. Published on Wed, 17 Apr 2019 13:58:43 GMT, © All rights reserved by the publisher.